IBM MobileFirst for iOS Advise & Grow enables bankers to make analytics-based recommendations and complete secure transactions for their clients. IBM MobileFirst for iOS Advise & Grow enables bankers to make analytics-based recommendations and complete secure transactions for their small business clients. Advise & Grow is powered by deep data and can provide real-time customer profiles and history on demand. The app helps to increase personalization through forecasts based on a client’s prior behavior patterns. It provides instant access to application forms, credit checks and approvals – even when a banker is on site with a client. Bankers can use the customized insights to provide timely advice and help their clients grow their business. Offer clients strategic recommendations based on analytics and fueled by market and industry insights. Combine customer information and relationship attributes, such as business segmentation, volume of business and product portfolios. 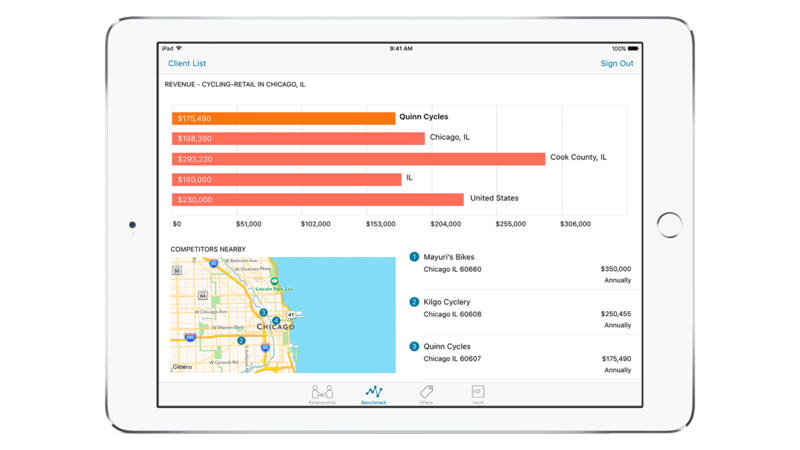 View visually rich graphics, charts, and stats on an iPad. Access vast databases of financial data and analytics.